The Constitution of India is probably one of the least read of texts in India. It enjoys neither popular affection, nor particular appreciation. However, the original book that is this painfully-detailed mammoth text, is a piece of art in its own right. 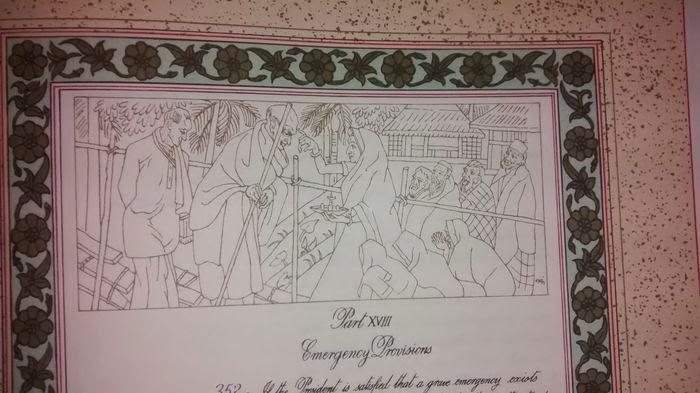 While the main body of the text is something we are all vaguely aware of, thanks to civics classes in school, the artwork that details each page of the original book is something most of us are unfortunately unaware of. Through this piece intends to focus on the images and the artwork that is an integral part of the Constitution and unravel the meaning behind each image and each piece of art, thereby, further adding meaning and layers to the otherwise tediously boring sounding words. The Constitution is a fusion of a historical document with a contemporary writing style which needs to be made more accessible, eliciting greater appreciation and recognition. Here's the catch. We don't like to read much. So I have taken up the challenge to write a description of the images in 140 twitter-worthy characters. What is a constitution and why do we need it? The constitution of a country is a set of written rules that are followed by the citizens of the nation. It is the supreme law that determines the relationship between the citizens and the government. It generated a degree of trust and coordination required for enabling a diverse population living together in harmony. Constitution also specifies the formation of government and the structure of power distribution. It not only states the rights of the citizens but also expresses their aspiration and visions for creating a better society. Before we begin the visual journey,let us glide through some popular facts about the Constitution of India. It is the longest constitution with 448 articles, 12 schedules and 94 amendments. After the constitution was presented to the Constituent Assembly, they took two years, eleven months and seventeen days to pass it. As many as 284 members of the Constituent Assembly had signed the documents on January 24, 1950. Two days later, the constitution came into effect. On January 26, 1950, the Indian Government also adopted Sarnath, the Lion Capital of Ashoka with the wheel, bull, and horse as the national emblem of India. And, it is the only constitution in the world which has images. The details and text makes it an art of a different kind. Let us start with a question. 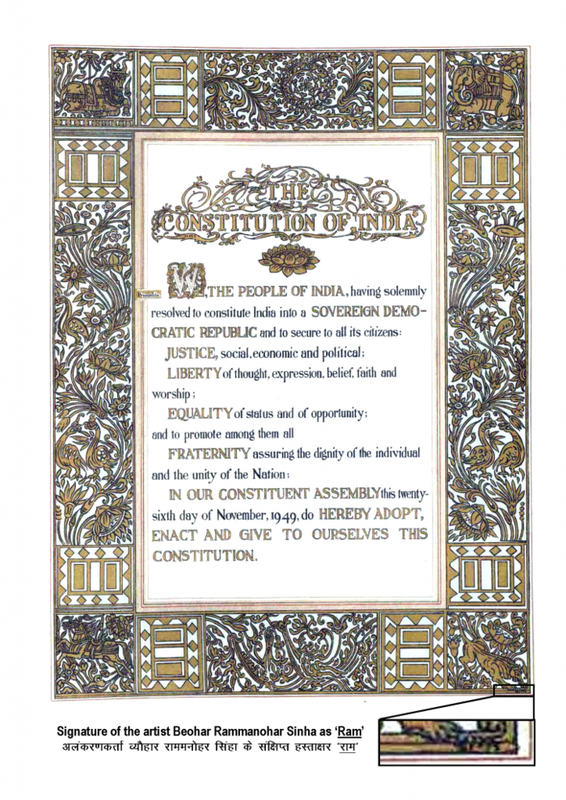 Were you aware that the original Constitution of India was not printed but handwritten? Don't worry. You ain't the only one. A majority of the Indian population is not aware of that fact. 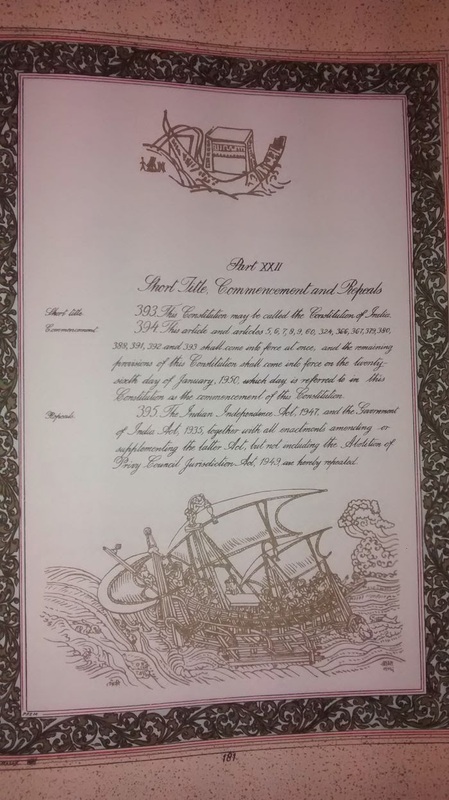 The exquisite original hand-crafted constitution was a product of artistic inventiveness of Acharya Nandalal Bose and his student from Kala Bhawan in Shantinikentan over a time period of five years. 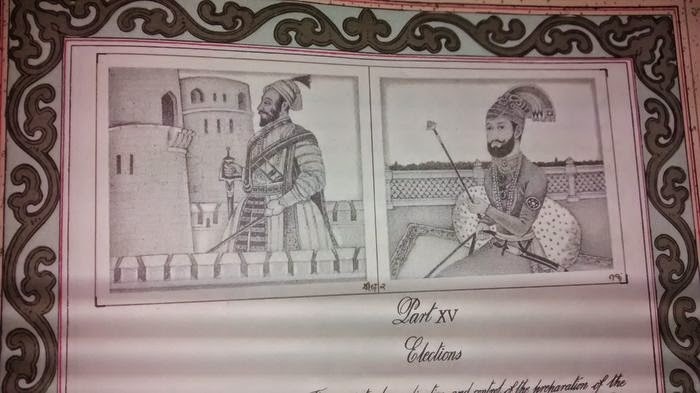 Prem Behari Narain Raizada did the calligraphy using a holder and nib, (303 no. nib). 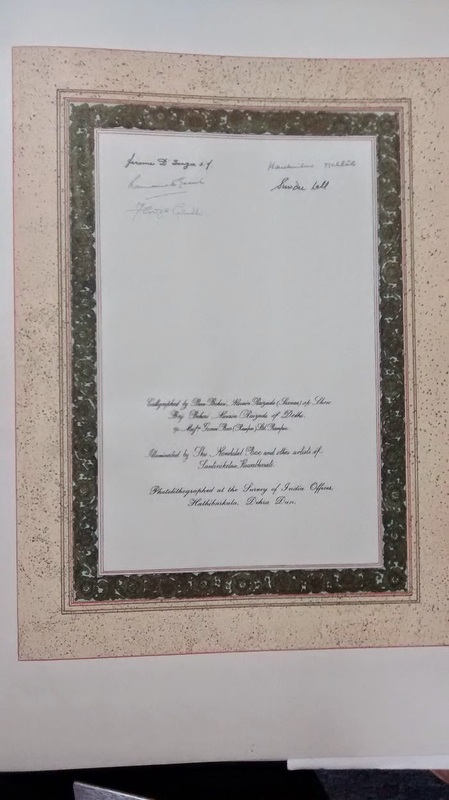 The Government of India had allotted him a room in Constitution House where he completed this prestigious work, for which he did not charge any fee. Shree G. Mavlankar (first Speaker of India) had written in a letter – “I must mention that he (Raizada) did the work merely for his love of art & his country, without any demand or expectation even of remuneration”. The only condition he had was to be allowed to write his name on the bottom of each page. 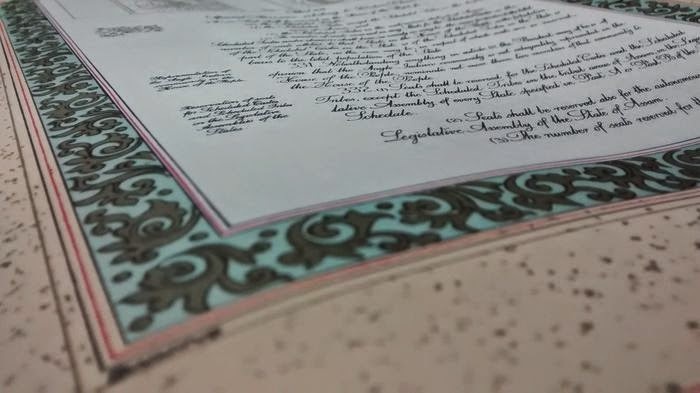 Along with his students, Nandalal Bose in Shantiniketan, took up the historic task of doing the art work for the original handwritten version Constitution of India. In addition to planning and providing the leadership for this ambitious work, Nandalal Bose himself painted the major images. 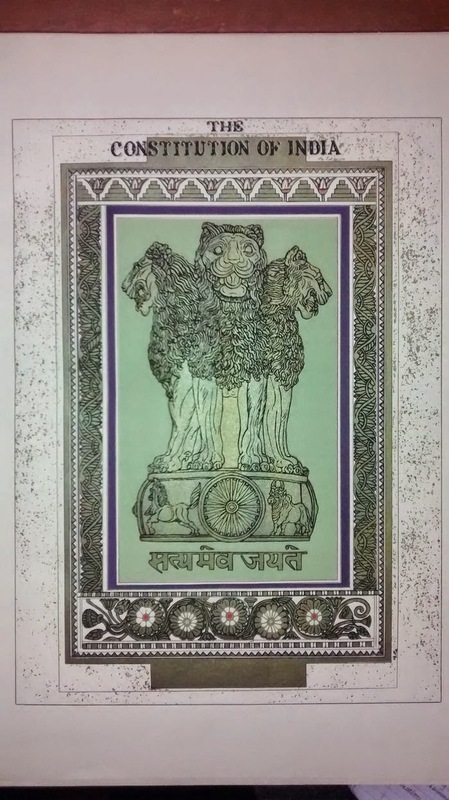 The “Preamble” page, arguably the most important one in the constitution, was done exclusively by Beohar Rammanohar Sinha and it bears his signature, Ram, in the Devnagari script. 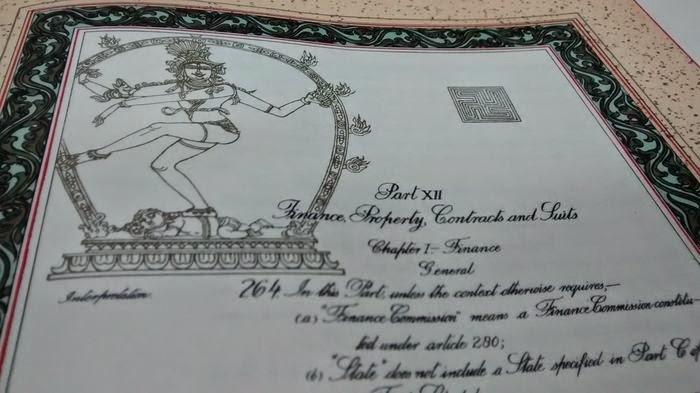 Beohar Rammanohar Sinha initially did not sign it, but his teacher, Nandalal Bose insisted that the former must sign the page so that future generations are able to recognize, remember and celebrate the artist who ornamented the face of the Constitution of India. 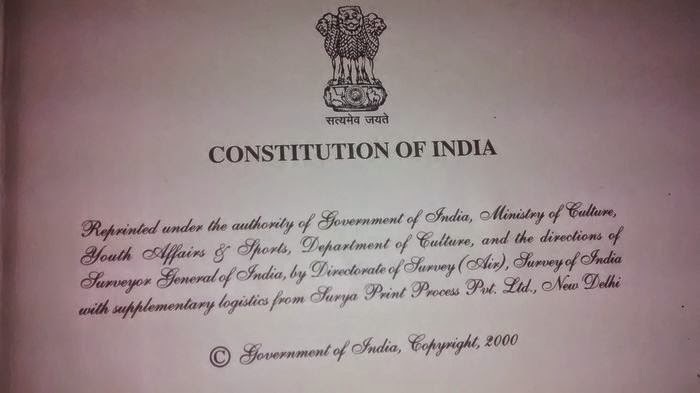 The Preamble with the signature of Ram. He significantly contributed to the execution of line-drawings and gold-works that bear Nandalal Bose’s signature “Nand”. A minor analysis of the images. 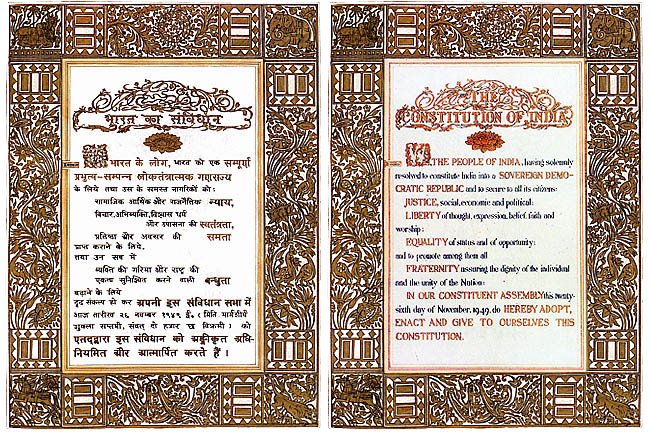 Pages of the Constitution are embellished with highly stylized decorative borders, headers and backdrops. The complex decorative patterns in the borders and in front and back covers, embossed in gold on leather, are reminiscent of the Ajanta ceiling murals. At the beginning of each part of the Constitution, Nandalal Bose has depicted a phase or scene from our national experience and history. Nandalal Bose has taken us through a veritable pictorial journey across four thousand years of rich history, tradition and culture. The art work and illustrations (twenty two in all) rendered largely in the miniature style. Represent vignettes from the different periods of history of the Indian subcontinent ranging from the prehistoric Mohenjodaro in the Indus Valley, the Vedic Period, the Gupta and Mauriya Period and the Mughal Period to the national freedom movement. The Vedic period is represented by a scene of gurukula (forest hermitage school). Epic period by a visual of Rama, Sita and Lakshmana returning homeward. 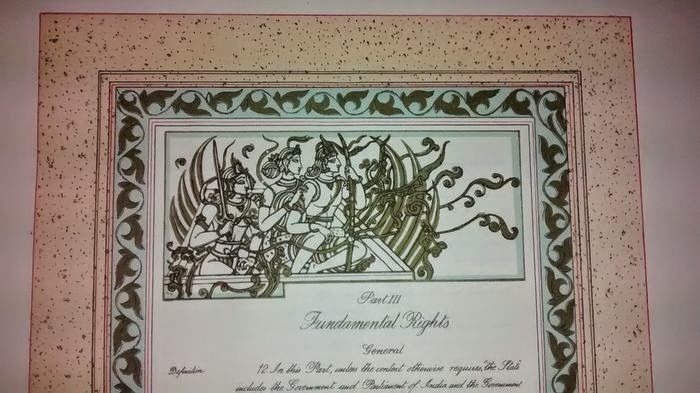 Trivia: This image of Ram, Sita and Lashman was used to for a verdict for the 'Ram Janmabhoomi' dispute. The court declared Ram to be a Constitutional entity as his image has been used in the constitution. 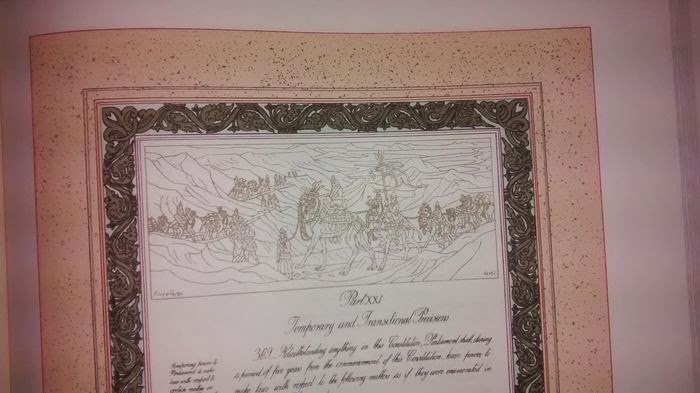 Another Kalabhavan artist who is said to have contributed to the art work of the original handwritten constitution was Kripal Singh Shekhawat from Rajastan. 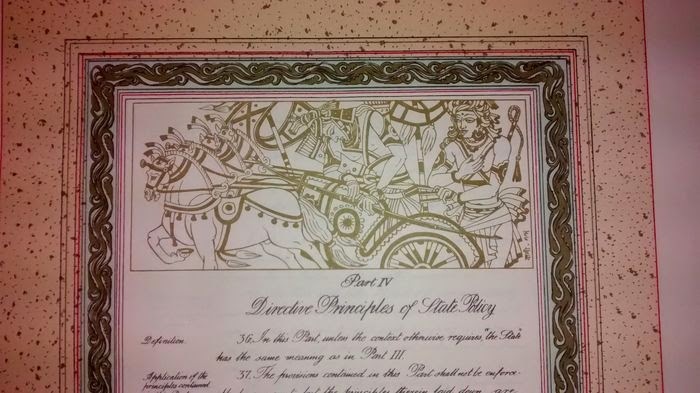 The constitution portraying the epic period by image of Krishna and in battlefield. There is a beautiful line drawing of the Nataraja, as depicted in the Chola Bronze tradition. The freedom movement is depicted by Mahatma Gandhi’s Dandi march and his tour of Noakhali as the great peacemaker, and of Netaji Subhas Chandra Bose. Snippet of history: the page that describes the commencement of the constitution. 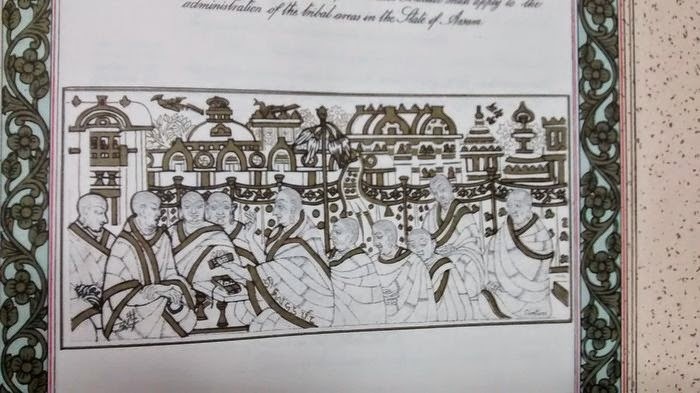 The illustrations and the decorative borders are quintessential of the Santiniketan (Kalabhavan) style, which in turn was greatly influenced by the cave paintings of Ajanta. In many ways, this original hand crafted Constitution of India represents one of the triumphs of Shantiniketan and Kala Bhavan. If you found the constitution of India exotic and intriguing read the entries in detail over here. 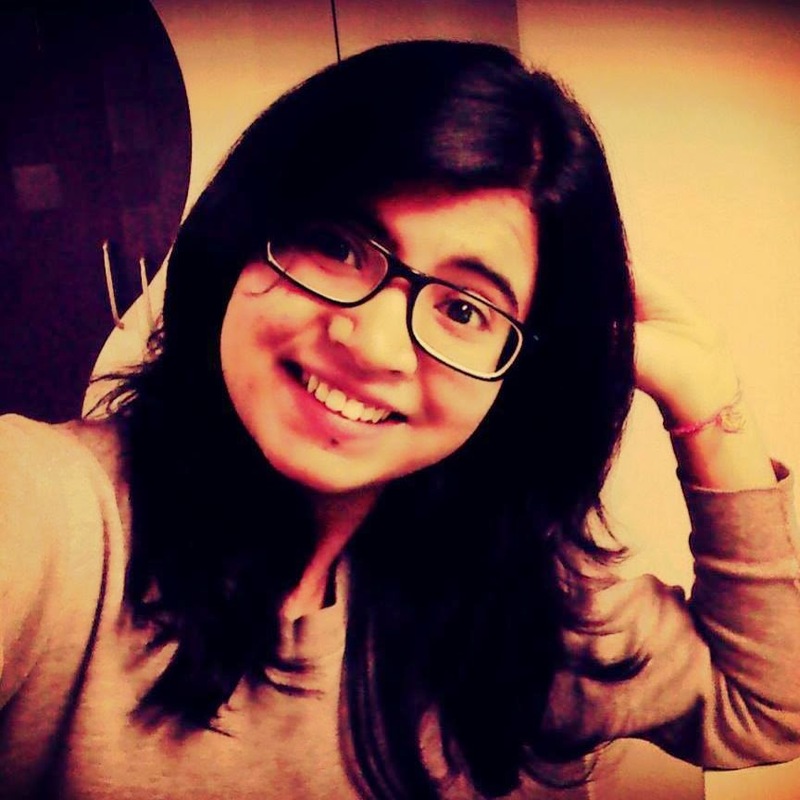 I am Sneha Nanavati and I am a bibliophile. I am an obsessive compulsive dreamer guided only by my zeal for learning new skills.I like to live my life to fullest and dedicate my soul into what I do. I love to voice my opinion and would not settle for anything less that the best. I love creativity intermixed with a heavy dose of analytic and fact based information. I am quite inquisitive, determined yet sceptical by nature. I hopelessly love to lose myself in the world of books and selected telly shows. I love to be a medium for change and progress of a community as a whole.